There in Yahoo’s quarterly financial report on Tuesday — Marissa Mayer’s first day as the company’s chief executive — was the basic problem she faces. Revenue and net income were stalled at last year’s levels. Although Yahoo has amassed an enormous audience, some advertisers are looking elsewhere. But on Tuesday, for the first time in a long time, people took an interest in Yahoo. The day before, Ms. Mayer left a senior post at Google to lead the company that Google had left in its wake. Analysts and shareholders — desperate for signs of life from the moribund company — are eager to see whether Ms. Mayer, 37, can lure back advertisers, reinvigorate a muddled brand and improve morale at a company marred by executive churn, constant cost-cutting initiatives and mass layoffs. 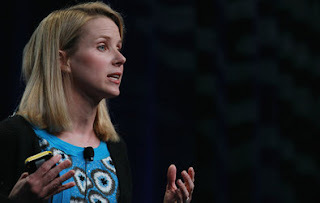 “Bringing in Marissa Mayer gets people’s attention,” said David Hallerman, a principal analyst at eMarketer. “The sheer attention that they are getting because of hiring her will be helpful for a while. But it will only carry them so far,” he warned. The first problem she faces is Yahoo’s identity crisis. Previous chief executives — and there have been four of them in the last five years, plus two interim chiefs — have had a difficult time trying to define what Yahoo actually does. Most people cannot explain the company in a single simple sentence. “The age-old question with Yahoo has been: Is it technology first or is it media or content first?” said David Cohen, the chief media officer at Universal McCann. Most recently, under Ross Levinsohn, who has been the acting chief since May, Yahoo seemed focused on content. It announced a number of prominent deals with ABC News, including a new weekly Web video show starring Katie Couric called “Katie’s Take.” During a presentation made to a room full of advertisers in April in Manhattan, Mr. Levinsohn highlighted Yahoo’s own coverage of sports, finance, the presidential campaign and the coming Summer Olympics. With 700 million users, Yahoo still draws one of the largest audiences on the Web. More people use Yahoo’s e-mail service than any other service. Yahoo Sports, Yahoo Finance and Flickr, the photo site, are the most popular destinations in their categories. But over the last few years advertising technology has grown more sophisticated and advertisers themselves have come under financial pressures, prompting many of them to buy ads more cheaply and more quickly through ad networks and auction-based sales. Yahoo’s advertisers are now experimenting with new platforms, most notably Facebook. To challenge Google’s ad dominance, Yahoo formed a partnership with Microsoft and AOL last year on a deal to sell advertising for one another. And in January, Yahoo bought the online advertising company Interclick, which allows marketers to tailor ads to specific demographics. The two moves led to the creation of Genome, Yahoo’s new digital advertising product, which offers advertisers data about their users and crunches that data so marketers can create custom ad campaigns. But Yahoo’s revenue from online display ads rose just 2 percent in the second quarter compared with a year ago, and it continues to lose market share. Brian Wieser, a senior research analyst at Pivotal Research Group, said advertisers had grown largely indifferent toward Yahoo. “What would get them more money is if they have a sexier brand,” he said. That’s where Ms. Mayer’s Google sheen could help the company. “We don’t know that she’s not the next Steve Jobs,” Mr. Wieser said. Ms. Mayer may have the hardest time taking Yahoo into the mobile advertising arena, a market dominated by her former employer. Unlike Yahoo, Google and Apple dominate the mobile advertising space with hardware and software options. Ms. Mayer skipped Yahoo’s earnings call Tuesday. Thanks to cost-cutting initiatives and restructuring, Yahoo’s second-quarter earnings beat analysts’ expectations, but revenue was flat at $1.22 billion. The company reported Tuesday that net income in the second quarter fell 4.2 percent from the same quarter a year earlier, to $228.5 million, or 18 cents a share. Nicole Perlroth reported from San Francisco and Tanzina Vega from New York.